Catwalk couture! DJ battles! Lego Kachinas! Indian Market has come a long way from its roots in scrupulously traditional Pueblo pottery—although it still has that in abundance. Last year’s debut of the Indigenous Fine Art Market added two days and hundreds of booths to an ambitious marketgoer’s itinerary, and the main event shows no signs of ebbing after nearly a century at the center of the Native art world. Take a peek through photographer Jeremy Wade Shockley’s lens at the personalities and talents that make for an unforgettable weekend at one of New Mexico’s liveliest and most iconic traditions. It’s not up for sale or prize ribbons, but dance is part of the quick-beating heart of Indian Market. 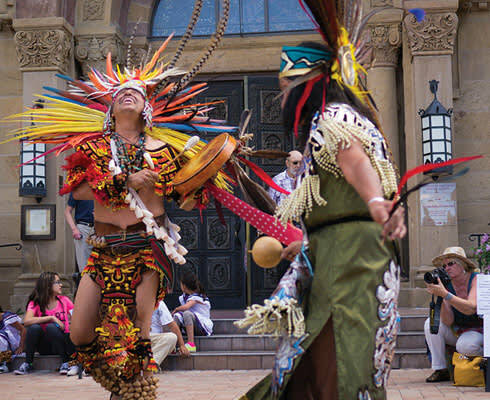 Aztec dancers based in Taos took to the cathedral steps in full regalia, at the same time that young Puebloans performed a buffalo dance (above, left) in the adjacent Cathedral Park. 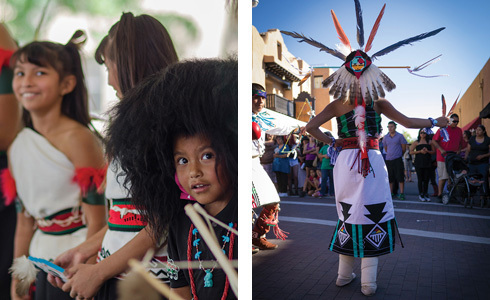 Near the Plaza, the Cachini Dance Group drew a crowd with their repertoire of traditional Zuni steps (above, right). Artists’ booths overflowed with variety. 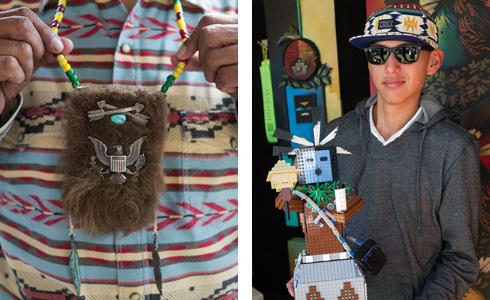 “It was fun—something different, I guess,” 17-year-old Navajo artist Tulane John said of his popular Lego kachina (above, right), which took first place in his age group for sculpture. Southern Ute elder and military veteran Austin Box (above, left) strung a buffalo-hide pouch on a necklace beaded in the colors of the Vietnam Service Medal. What might the pouch hold? “Oh, anything. My cell phone,” Box laughed. 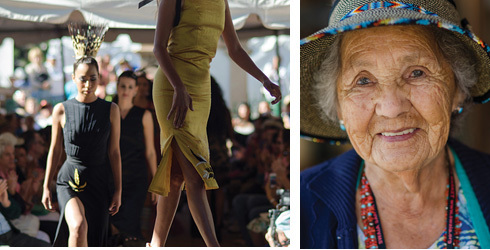 On Sunday morning, the Native American Clothing Contest packed the Plaza with a fashion-conscious crowd scoping out traditional and contemporary designs on models of all ages. In the nearby booths, artists’ wardrobes were similarly split between old and new, trendy and timeless. The Navajo artist Helen Toledo (above right), 88, has been showing beadwork and textiles at the same spot on East San Francisco Street for a long time. How long? ”All my life,” said her 33-year-old grand-daughter April Toledo, a fellow beadwork artist. Helen’s great-grandchildren played at April’s feet while Curtis, Helen’s son, handled the business side of things, completing a four-generation tableau that illustrated Indian Market’s enduring family traditions. On Thursday night, the Smithsonian’s National Museum of the American Indian co-sponsored a free concert at the Museum of Indian Arts and Culture on Museum Hill, where the Canadian electronic group A Tribe Called Red played “powwow-step” music for a stoked crowd. James Jones, of Tall Cree First Nation, did a hoop dance with hip-hop flair while a screen behind the performers flashed archival photos. 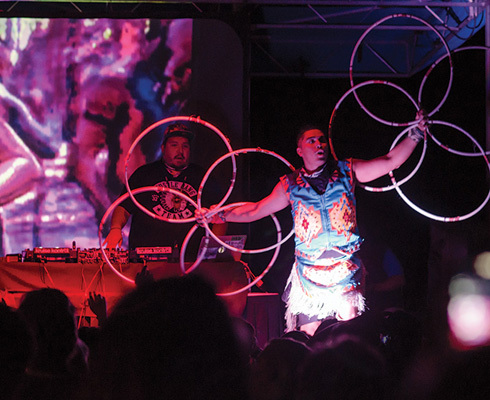 In the Railyard District, the Indigenous Fine Art Market hosted a steady rotation of DJs, dance groups, and bands onstage from Thursday to Saturday (indigefam.org). On Friday evening, the Prismatic Fashion Show turned the main stage lawn into a showcase for models sporting the work of young Native designers like Sun Rose Iron Shell. Long after the show was over, friends crowded around to congratulate the participants, their laughter spilling out into the Santa Fe night.